"The class is wonderful. 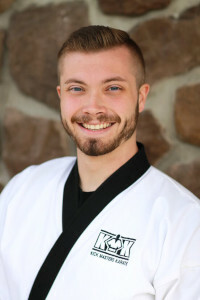 Mr. Rando and his Junior Black Belts teach and support the students so that each child feels a sense of accomplishment, even in the drills that are difficult for them. There is consistency, which is crucial to growth... Kira is much more focused and settled. The Little Dragon's class has been of great benefit in helping develop self confidence and coping skills when tasks are difficult." "We are very pleased with the class structure. Ethan's classes have been well organized and run to perfection. Each class begins on time and the activities are mixed so that the students do not get bored. My son has grown in confidence. He has learned many of the integrity lessons of the class, and has incorporated them into his life. He enjoys physical activities more today than before Little Dragons. Ethan is now a leader!" "It is obvious that careful planning goes into each and every activity and every special event. There is never any disorganization." "I appreciate the way that the Little Dragons classes are fun-fused with focus and self-confidence. I think that one of the most effective ways to teach this age of children is through fun, and the classes certainly do this. Also, all of the great community-centered events that Kick Masters encourages, provides a great foundation for these kids to become conscientious members of society." "Everyone knows exactly what is expected of them. The system's teaching methods are kind, yet happy, as instructors are aware of each child's individual strengths and stress them. Ella has become more focus-oriented and shows improvement at Humpty-Dumpty pre-school. She is now the school's 'Simon Says' master, thanks to 'Mr. Rando says!'" "I think the structure is excellent. In other sports that Stephen has been involved in there is very little structure and/or consequences for disturbances. With Little Dragons, I feel that if someone is being a disruption to the class, there will be gentle but firm action taken." "Eliza is more determined than ever, she responds to ideas like, 'never give up,' and always does her best in class. She gets tons of compliments on her level of politeness. She often opens and holds the door for others, refers to adults as either 'sir' or 'ma'am' and is always ready to clean her room and make her bed. I love it!" "Classes at Kick Masters are fantastic. They are very organized, kid oriented, and well run. I especially like how when my son was a new student, he was not treated like he was new. Information, rules, and comands, were given to him as other kids were reminded. Well done!" "Aiden helps more around the house and school with cleaning up the toys and with chores. He always follows the directions and rules at school, and plays well with others, knowing when and not to speak out in class. Aiden enjoys Little Dragons, as he learns fundamentals while, most importantly, having fun." "Every instructor who has led the Little Dragons Classes has been very positive and enthusiastic. Each has encouraged the students to do their best and celebrates all successes, no matter how small. We have noticed that Connor is more responsible and respectful. Trevor almost always says 'sir' or 'ma'am' when talking to adult family members. Brendon is improving his ability to focus which is tranferring to his schoolwork; we have also seen an improvement is his agility and gross motor skills. We look forward to class each Saturday!" "Classes are well structured, organized, and offer a challenge. A child is left with a sense of well-being, accomplishment, and a smile on their face. My children leave class feeling good and look forward to their next class. Instructors at Kick Masters demonstrate leadership, patience with small children, offer a fun way to learn, are able to offer guidance in a caring manner, and help develop skills needed in life to become a good citizen. Respect, responsibility, self-motivation, confidence are just a few character traites demonstrated by this teaching method." "Both Alex and Nevaeh have demonstrated confidence in their self, the ability to focus, respecting others, and responsibility. Socialization and following directions as a team/group have improved as well. Applying their 'life word' to everyday living has developed creativity 9(they even have a scrapbook stared with their 'life words' and how they have used them in everyday life). The class structure and organization offer a child building blocks for good self-esteem and confidence. Earning their stripe at the end of the month is an honor, and encourages the child to continue to grow into a good citizen."